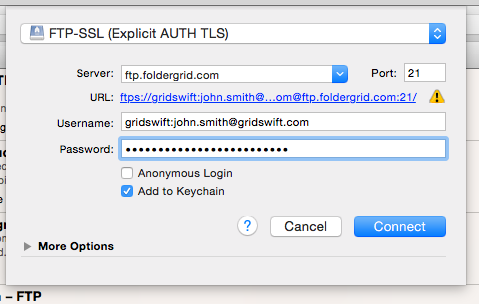 Set the correct username: Your FTP username is prefixed with your domain followed by a colon and then your actual FolderGrid username. Note: The nature of FTP dictates that using it will be slightly less efficient than uploading directly through our API or reference clients and we recommend using it only where necessary. Also - you should adjust your FTP client's settings to allow a minimum of 60 seconds for any timeouts. Otherwise your client may report a transfer failure (due to timeout) where the upload actually succeeded but simply required a bit longer than expected to fully encrypt.